What would you do if a year into your first business you were faced with four-and-a-half feet of water running through your property wiping out $6 million worth of vehicle inventory, all the office furniture, phones, marketing collateral and even the plants? Would you give up and just walk away? While that was an option for Jeff Hobson and his partners, it really wasn’t a viable option in his mind. He explained that it wasn’t only the financial situation that made the decision, but also something he remembered someone telling him years before. He was told that the money you make in a business isn’t just what you build for yourself and your family; it’s also for all the people who work with and for you. He knew the disaster wasn’t just a disaster for him. More than 225 vehicles in inventory were lost, the building had to be gutted and remodeled, all the equipment in it needed to be replaced. But the team pulled together and rebuilt; one car, one sale, one day at a time. It was weeks before they had phones and computers and doing everything “old school” was a struggle. But once they overcame as a team with a common goal. They have continued to move forward and increase business ever since. There was no looking back, only using the past as a benchmark from which to grow. In May, 2015, Hobson bought out his partners and the name on the sign was changed from Gates to Hobson. 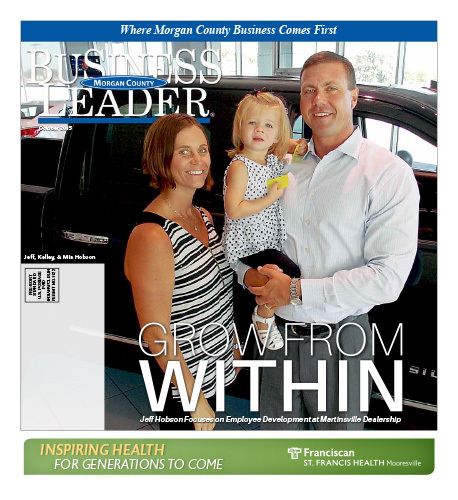 Download the full October 2015 Edition here.